Live tonight at 9:30 PM EST, I’ll be joining BlueShirt Nation for a special debut show of Rangers Hot Seat. Tune in on Blogtalk Radio to hear our analysis on the Rangers’ poor start. They’re now 1-5-1 with just three points which are tied with the Canadiens for the fewest in the East. They trail first place Columbus and New Jersey by seven already. What’s gone wrong? Everything. They’ve been outscored 26-17 and remain a inconsistent mess. They’ve lost close games like last night’s failure to close out the Pens with Henrik Lundqvist allowing a bad goal to Sidney Crosby with 55 seconds left. A play in which Kevin Shattenkirk didn’t realize it was a hand pass, mistakenly playing the puck to give Crosby a chance for one of his patented Gretzky backhand specials from the goal line. Even in a game they played well skating with the defending champs by rallying from a 2-0 deficit by scoring four of the next five goals, it wasn’t enough to win due to the failure to protect a lead in the final minute. A similar theme last Spring against Montreal and most notably Ottawa. Is it mental? Most of the group is still intact with GM Jeff Gorton subtracting top center Derek Stepan and Oscar Lindberg along with Dan Girardi. Some of the leadership is gone. It’s up to underachieving Kevin Hayes and Chris Kreider to provide more. Instead, neither has established themselves yet. Let’s not forget they’ve only played seven games. While most are pushing the panic button, there’s plenty of time to turn it around. Are they capable? It largely depends on the aforementioned Hayes, Kreider and other key players such as Brady Skjei, Ryan McDonagh, who has been brutal so far. His giveaway causing an easy overtime put away for Evgeni Malkin. A play he admitted to making a foolish decision. With Lundqvist the emotional leader along with veteran Mats Zuccarello and forgotten stalwart Marc Staal, who’s been better than expected, they have a lot of proven guys in the locker room who can lead. Mika Zibanejad has stepped up his game with five goals and better attention to detail as the new top pivot. J.T. Miller’s game is coming. 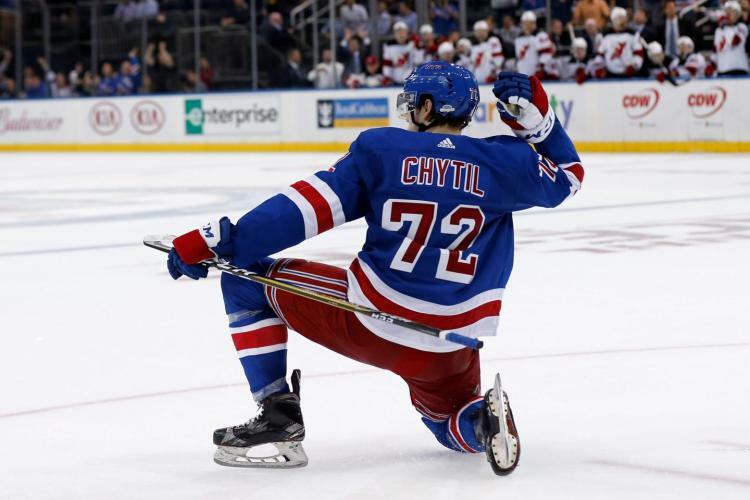 He posted a goal and two helpers on Tuesday to overtake Zibanejad and Zuccarello for the team lead with seven points. Jimmy Vesey must get untracked. He remains stuck with a goose egg despite some good work yesterday. He can do better than 14 shots but needs to earn consistent ice time. I like the idea of him with Hayes and Jesper Fast. But Hayes has to get checked in defensively. There were a couple of lazy shifts where he didn’t get back. That can’t happen. He’s the number two center. David Desharnais performed well last night recording a goal and assist while establishing chemistry with Miller and Michael Grabner, who finally got on the board off a textbook give and go. I wish I could say the same for Kreider, who has been disappointing with three assists and no goals. That can’t continue. He’s too important to the team’s success. Despite continuing to generate quality chances, Rick Nash remains stuck on one goal. He certainly works hard using his speed and skating off the rush as well as on the forecheck. The goalpost must be in his nightmares. If there’s a gripe, it’s the coach. Alain Vigneault has been here long enough to know sometimes, you have to make everyone accountable. If that means Hayes or Kreider missing a shift or two, so be it. The guys who bring it consistently should be rewarded. Was there any rational explanation for not giving Pavel Buchnevich more ice time following his power play goal? He only received 5:49 at even strength remaining on the fourth line with Adam Cracknell and mostly Grabner. Buchnevich should be getting at least 12 minutes. He’s been one of the few bright spots. Tony DeAngelo played a better game showing off his skating and transition. Vigneault must stick with him. That’s the only way he’ll grow. If they can’t beat the Islanders who will be visiting MSG off a three game California swing going 1-2-0, the pressure will mount. The Rangers have to show improvement in the final two home games against their blood rival and the Predators on Saturday. That means playing a full 60 minutes and stringing together something they haven’t done yet. Back to back wins. If they can do that, then this can happen. This entry was posted in NYRangers and tagged Blueshirt Nation, Brady Skjei, Chris Kreider, Islanders, J.T. Miller, Jimmy Vesey, Kevin Hayes, live show, Marc Staal, Mats Zuccarello, Mika Zibanejad, NYRangers, Pavel Buchnevich, Rick Nash, Ryan McDonagh. Bookmark the permalink.